Banksy's stencils are among the best-known works of international Street Art. With his latest coup, the anonymous British artist has reached a new, radical climax in his career. 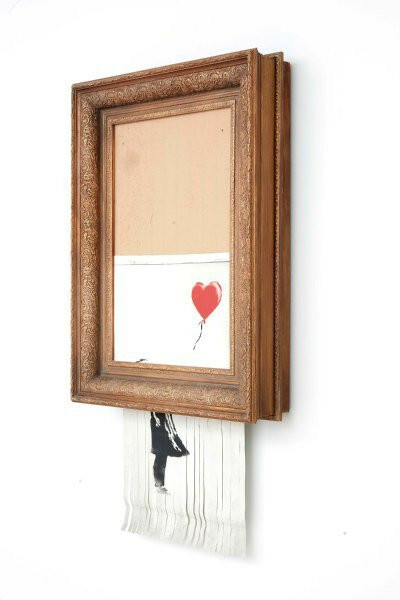 During an auction at Sotheby's in London, right after the hammer fell, he caused the destruction of the auctioned artwork "Girl with Balloon" by remotely shredding it with a device hidden in the frame. Following Banksy’s own specific logic, with this intervention he attacked the art market in order to simultaneously boost its dynamism, attracting world-wide attention. After the auction, the artist has declared the partly shredded piece a new work of art and entitled it "Love is in the Bin". Sotheby’s stated that it marked the first time a piece of live performance art had been sold at an auction. Find a selection of available artworks by Banksy here, or place an inquiry for further information.